In a dramatic move away from Cummins, Hyster Europe has revealed that its Stage V lift trucks for European customers will be powered by Mercedes-Benz/ MTU engines. “Our heavy industry and port customers in Europe, who will require a Stage V driveline, can continue to expect highly efficient trucks with low fuel and DEF consumption, benefiting from high productivity levels and fast operations with the power available,” said Jan Willem van den Brand, Director Big Truck Product Strategy & Solutions at Hyster Europe. All Hyster lift trucks over 8 tonnes - FLTs, ECHs, reach stackers and LCH mast trucks - will be equipped with the Stage V-compliant Mercedes-Benz/ MTU Series 1000 (OM 934, OM 936) and 1100 (OM 470) engines. The exact availability varies per series and will be communicated in due course. All the new engines combine EGR, DOC, SCR and DPF technologies. The OM 934 has a displacement of 5.5 litres, the OM 936 7.7 litres and the OM 470 10.7 litres. This compares with the Cummins Stage IV QSL 9 (8.9 litres). The engines have been specially designed for industrial applications such as material handling and further developed to meet EU Stage V regulations. They are based on commercial vehicle engines from Daimler. “Mercedes-Benz/MTU engines have a highly successful track record in both on-road and off-road applications such as forestry or agriculture. They are also particularly suited to intermittent applications like our business serves,” says van den Brand, explaining that the power ratings range from 129kW to 280kW depending on model. With service intervals of 1000hrs, good access to main service parts and outstanding durability, the Mercedes-Benz/MTU engines are expected to help reduce service costs. Hyster Europe will work in close cooperation with MTU to ensure its dealer network, familiar with Cummins engine used up to now by Hyster Big Trucks, will be fully trained and equipped for service support, meaning that end users will receive optimum support throughout their entire product life cycle. Going forward, it is not clear whether the new arrangements in Europe will have any bearing on Hyster Big Trucks sold in North America. Proud to share with you the professional performance of OPCA member EUROPRIM SHIPPING SRL, Romania. Europrim Shipping recently completed the river/road multi-modal shipment of an automotive press weighing 285 tons, dismantled into 3 pieces of 75, 100 and 110 tons. 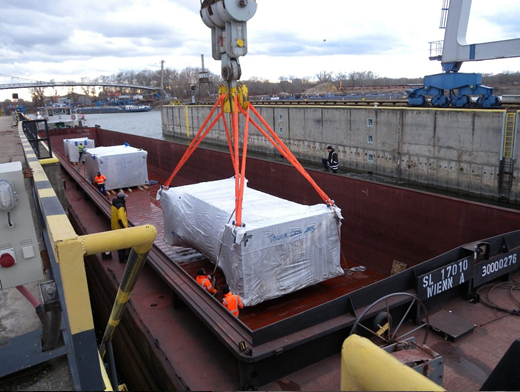 The pieces were received from the shipper in the Slovakian Port of Bratislava and loaded on a barge chartered by their special projects team for a 7 days further Danube River voyage to the Romanian Constanta Port. 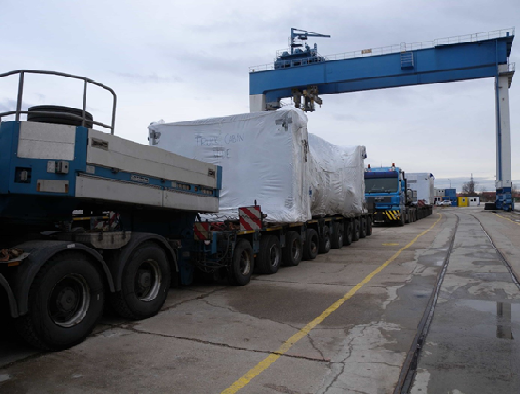 After receiving the cargo in Constanta, their operational team successfully managed the transshipment of the pieces onto special road trailers and organized the further door delivery to the consignee at Pitesti destination city, 350 km inland from the port. The three press components were safely and just in time delivered to the final consignee according to the agreed schedule. With this success, Europrim Shipping has proven once again its skills and expertise in the Romanian project cargo industry field, regardless size or weight. Congratulations to EUROPRIM SHIPPING SRL, Romania for their excellent job. The construction of the Port of Tilbury’s new multimillion pound port terminal, Tilbury2, will begin immediately after the UK-based company GRAHAM was appointed to carry out the work. In late February 2019, the port received development consent from the Secretary of State for Transport to build the new port. The project will involve the creation of a new port terminal and associated facilities on land at the former Tilbury Power Station on the north bank of the River Thames at Tilbury. When operational in spring 2020, Tilbury2 will be the UK’s largest unaccompanied freight ferry port and the country’s biggest construction processing hub. GRAHAM has been awarded the contract for both the Terrestrial and the Marine Package. The Terrestrial contract incorporates a roll-on/roll-off (RoRo), highway works, the relocation of the existing railhead, and a fixed structural steel bridge to the linkspan. The Marine contract includes works within the tidal estuary beyond the existing sea wall/flood defences, including a floating pontoon, link-span/articulated bridge, associated pilings and river bed preparation for the berth. “Tilbury2 is a significant project for our business and our customers… There is a great deal to do over the next 12 months and we look forward to opening our new port in 2020,” Charles Hammond, Chief Executive of Forth Ports Group (owners of the Port of Tilbury) said. “The Tilbury2 project is a complex scheme that will facilitate the expansion of the Port of Tilbury and support its continued local, regional and national economic growth. We look forward to working collaboratively with The Port of Tilbury and local stakeholders to deliver this transformational scheme,” Michael Graham, GRAHAM Executive Chairman, commented. Tilbury2 is central to the Port of Tilbury’s GBP 1 billion (USD 1.3 billion) investment program during 2012-20. The offshore wind sector is set to install more than 69 gigawatts of new capacity through 2027, driving breakbulk demand globally, according to the latest research from consultancy Navigant Research. “Power purchase prices for projects are dropping, driven by turbine size and other technology improvements, economies of scale, faster installation cycles, and increased supply chain competition,” a spokesperson for Navigant said. Navigant highlights the UK, the Netherlands, Denmark, Germany and Belgium as “industry-leading countries” already well into the transition phase to market-oriented policies where highly competitive bidding for power contracts dominates. However it also notes that more developed countries are reaching maturity for offshore wind auctions, with bidding already started in the U.S. ahead of offshore project installations along the northeastern seaboard. One of the largest of these projects on the U.S. Northeast coast is the Vineyard Wind development off the coast of Martha's Vineyard in Massachusetts, which was recently approved by the Coastal Resources Management Council. The 84-turbine project is expected to generate 800 megawatts once complete and drive demand for offshore breakbulk handling skills not yet established in the U.S. following backing from the island’s dominant fishing industry. "We are confident that today’s vote, combined with the US$16.7 million comprehensive funding package developed in consultation with Rhode Island fishermen and CRMC staff, will allow the Ocean State’s fishing industry to safely operate and grow side-by-side with our project and future offshore wind developments,” said Lars Pederson, CEO of Vineyard Wind. Biz Events Management, proudly announces a one day Conference KUWAIT SYMPOSIUM-MARINE/OFFSHORE/OIL & GAS – FORUM on 13th March 2019 at Jumeirah Messilah Hotel, Kuwait. This one day conference will see global industry experts participate as speakers, panelists and delegates outlining the key updates about the Marine, Offshore and Oil & Gas Industry. Followed by the Conference there will an IMC EXCELLENCE AWARDS 2019 – KUWAIT CHAPTER at the same venue. The award will honor the best dedicated and hardworking individuals/ organizations who have endowed their best to the betterment of maritime industry. Please click here for more information about KUWAIT SYMPOSIUM-MARINE/OFFSHORE/OIL & GAS – FORUM. Proud to share with you two professional performances of OPCA member PROJECTS FPS (PVT) LTD., Sri Lanka. They successfully handled 100 units of garbage trucks in port of Hambantota, Sri Lanka and mobile pneumatic conveying system machinery movement from Germany to Sri Lanka during mid February. 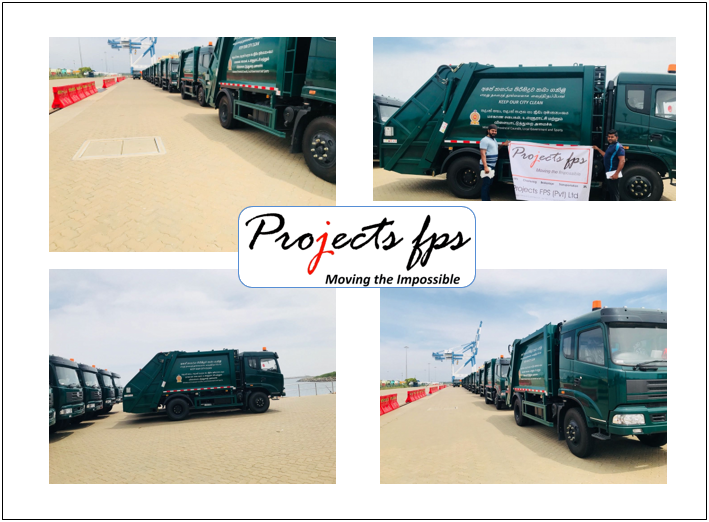 Projects FPS (Pvt) Ltd, Sri Lanka successfully completed the first movement of hundred units of garbage trucks which arrived by RORO to Hambantota port Sri Lanka during mid February 2019. The services rendered by Projects FPS are port handling, customs clearance, transportation including temporary storage of units near to port of discharge for a period of 20 days until all vehicle registration were completed. The trucks were under Projects FPS supervision until they were handed over by our client to the Government of Sri Lanka. The total operation was carried out by PFPS special operations team, headed by Project Manager Ishan Fernando and the client was extremely satisfied with the services and technical assistance rendered by Project FPS in completing the operation with zero errors and damages and with timely delivery. Projects FPS is very much confident and looking forward to handling the balance project shipments in similar manner. 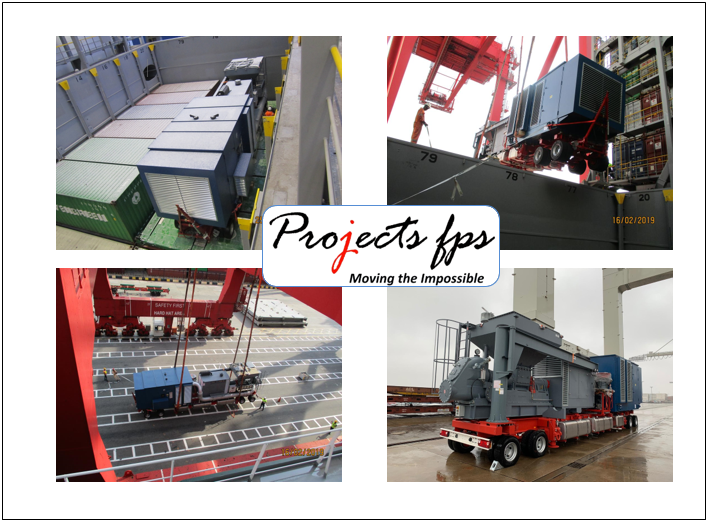 Projects FPS (Pvt) Ltd, Sri Lanka successfully completed the first movement of a mobile pneumatic conveying system from port of Hamburg to Port of Colombo mid February 2019. The said unit was loaded on Mv. Ever Gifted V. 1014-001E as Break Bulk cargo due to the fact of length 18 mtrs, width 14.5 mtrs, height 15 mtrs and weight of 47,000 kgs. 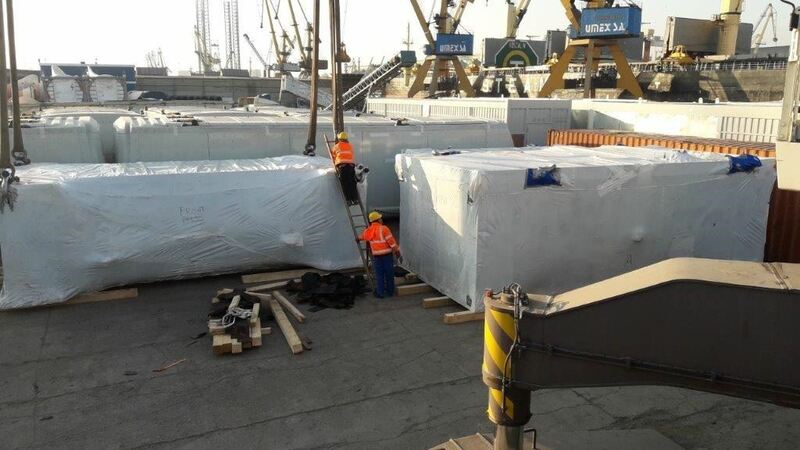 The services rendered by Projects FPS included pick-up of cargo under hook at port of loading, ocean freight, port of discharge operation, and customs clearance. The total operation was carried out by PFPS special operations team and the client was extremely satisfied with the services and technical assistance rendered by Project FPS in completing the movement with zero errors or damages and with timely delivery. Congratulations to PROJECTS FPS (PVT) LTD., Sri Lanka for their excellent jobs. Description: 3rd Annual Transport & Infrastructure Vietnam is a 2-day conference that is being hosted on 16th – 17th April 2019 at Park Hyatt Saigon, Ho Chi Minh City, Vietnam. This conference focuses on the future of Transport & Infrastructure in Vietnam with further discussions about Vietnam National Transport Development Strategy 2020, Vietnam National Railway Masterplan 2030 to 2050, TRAMOC activities and Port & Logistics Development in Vietnam. It also discusses the potential for growth of the transport infrastructure sector including Rail, Road, and Marine & Air Transport in passenger & freight movement. It’s a platform to discuss and debate best practices which can be instrumental in increasing the infrastructure in the region. To download the conference agenda and more information, kindly click here. Today it is our pleasure to share with you that in addition to their Chile office, BLS FORWARDING CHILE LIMITADA has extended their presence in our network with their Germany office BLS BREMER LOGISTIC SERVICE GMBH now. We are also pleased to announce that Christopher Schneider will be attending our upcoming Annual General Meeting in Kuala Lumpur, Malaysia at 28, 29, 30 June 2019. The gathering will be a great opportunity to meet all OPCA members. Please click here for more information about our event. From now on, please also do not hesitate to contact them for your inquires of Germany. Have a great cooperation together! BLS Bremer Logistic Service GmbH was founded in March 1995 and since then has enjoyed a reputation as flexible transport operator that engages close to the customer. Run by the managing partner, BLS is available to you with its highly motivated staff for all issues of logistics and freight forwarding. Given the experience of the company in all relevant transport issues, complex logistics concepts can be carried out reliably. Not only this, they can look back on many years working enjoyably with their satisfied customers and trusted partners. We are glad to inform you that CONVEYOR LOGISTICS LTD. has become a T-shirt Sponsor for OPCA 5th AGM, INO Summit 2019 Kuala Lumpur Malaysia. With their sponsorship CONVEYOR LOGISTICS LTD. will now be able to significantly increase their brand awareness not only during the event but also for the remainder of the year. Konecranes has received an order from the Thessaloniki Port Authority SA for 12 Konecranes Noell straddle carriers. The delivery time is exceptionally short. The machines will be ready for acceptance in March 2019. Thessaloniki Port Authority SA, a privately listed company, is the concessionaire and operator of the Port of Thessaloniki, Greece. This order is part of an ambitious growth programme that the port has embarked upon. “We entrusted Konecranes with this important renewal of our container handling equipment because of the high productivity and reliability of these straddle carriers,” Sotirios Theofanis, Chairman of the Board and CEO of the Thessaloniki Port Authority SA, is quoted. The straddle carriers on order are of the model NSC 644 E. They have a lifting capacity of 50 tons, lifting containers 1-over-3, with a maximum traveling speed of 24 km/hr. They will be equipped with the Konecranes Noell single-lift spreader model NES 42 F.
All Konecranes Noell straddle carriers are prepared for subsequent automation as standard. The contract includes a spare part package. In addition, a Konecranes engineer will be on stand-by at the terminal for three months, helping to train operators and ensuring that all the machines go into service successfully.